So I’ve made a decision. One that I hope all of you can understand. From this moment forward — and forevermore — I am done with mommy guilt. I’ve decided that I no longer have any use for it. The end. And it’s pretty darn empowering. To be perfectly honest, I could really give two hoots what anyone else thinks about me my parenting style, what I choose to feed my family, or how I discipline my children when they are throwing the tantrum of all tantrums in the middle of the grocery store. Every family dynamic is different, and as I am learning (day-in and day-out) there is no magical formula, no one-size-fits-all solution to the most challenging parenting issues. I choose instead to embrace the beautifully disastrous journey that is this thing we call motherhood. I choose to love and support the women of my tribe. To afford myself the same “mommy grace” I preach to so many of my girlfriends when they are in the weeds, when there seems to be no relief in sight. To accept the unconditional love of my family, and savor every precious, messy moment. Today I am drawing a line in the sand. Will you join me? 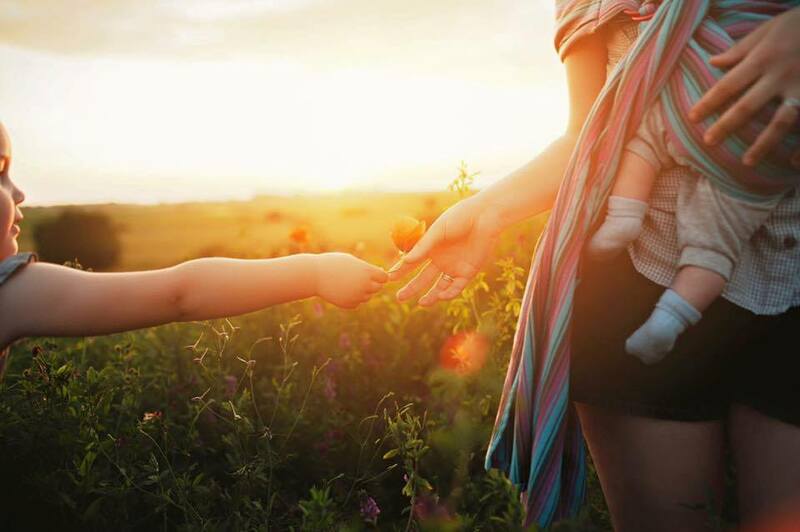 Let’s say goodbye to mommy guilt, once and for all. But how? We have to let go of the garbage, and accept that we are enough — enough NOW, just as we are at this exact moment in time. Worrying that I didn’t breastfeed my children long enough. That I have somehow prevented them from getting into Harvard, or prevented them from reaching their fullest potential. Like many (most) moms, I did the best I could. Worrying about the Baby Books I never finished. I would like to think that I will get to them eventually, but I have a sneaking suspicion this might not actually be true. My mom never finished my Baby Book, and look at me! I turned out (mostly) fine. Trying to please everyone around me. I am responsible for my own happiness, and the happiness of my immediate family. And that’s it. Pretending I have it all together. Because I most certainly do not. Feeling guilty about taking (a little) time for myself. Feeling guilty about allowing my children to watch television (gasp!) while I attempt to put away a load of laundry, or get a little bit of work done. It’s Disney Junior people, not Texas Chainsaw Massacre. With feeling ashamed for wearing yoga pants (again) to drop my daughter off at preschool. Hello, pregnancy insomnia. One day I will be chic. Just not tomorrow. Feeling bad for (occasionally) feeding my kids SpaghettiOs for dinner. And then popping open a can for my pregnant self. At least we had fresh fruit for dessert. Things could really be worse. Reading negative, nagging blog posts and Facebook comments that make me question my value as a woman and a mother. Hashtag, if you’re mean we can’t be friends. Hashtag, I’m sorry I’m not sorry.